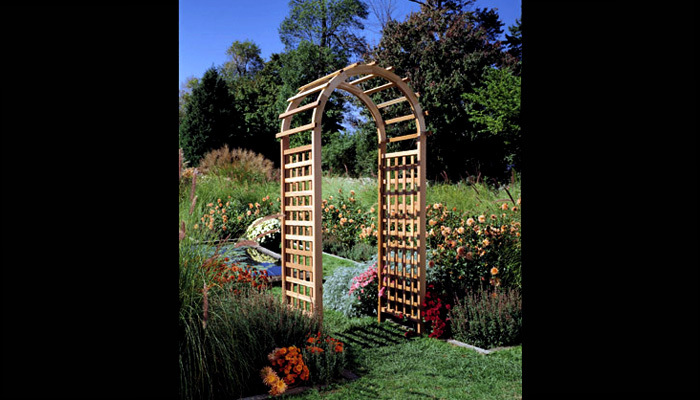 The Rustic Natural Cedar sturdy Western Red Cedar Standard Garden Arch is built to last, and can be painted, stained, or left to weather gracefully to a warm silver gray. 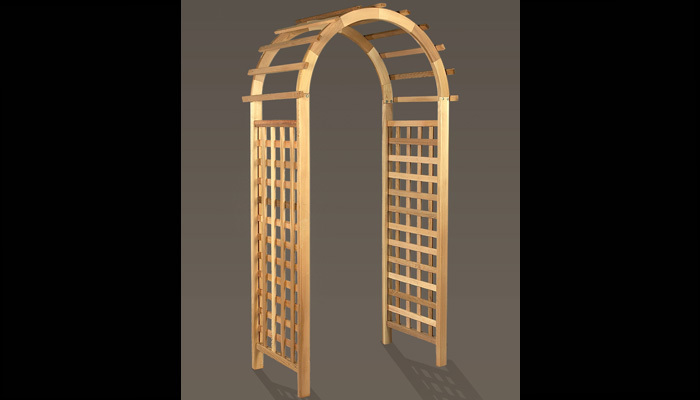 Covered in wisteria, climbing roses, or English ivy, these freestanding arch structures add architectural interest to any outdoor garden or walkway. Red cedar is naturally rot and insect resistant for years of useful beauty. Anchor Kit required for proper installation (sold separately). Quality arbors at an affordable price! For over 35 years, Rustic Natural Cedar Furniture Company has been manufacturing quality Cedar Looks brand products for the home and garden. Their broad variety of products includes tables and seating groups, gliders, rocking chairs, swings, arbors, and other garden products. These fine furnishings are handcrafted with care in Quebec and British Columbia and shipped to your home for your enjoyment. Long lasting good looks and low maintenance make cedar the natural choice for your home and garden décor. With the added benefits of beauty and comfort, cedar is an ideal choice for any setting. Cedar is the natural choice because of its beauty, practicality and durability. Rustic Natural Cedar uses only the finest cedar to create furniture that lasts for generations. It is naturally resistant to decay, insect and weather damage. Because of this superior resistance, cedar is frequently used for outdoor fencing and siding on homes. Cedar has an exceptionally high strength-to-weight ratio, which means that it is both durable and easy to move about. It does not shrink or warp as many other woods commonly do. Unlike pressure-treated wood furniture, there are no chemical preservatives that may be harmful to your family’s health. Adding an arbor is a fantastic way to add beauty and style to your outdoor living space. Two types of cedar are used by Rustic Natural Cedar Furniture - Northern White Cedar is used to manufacture Rustic Natural Cedar’s indoor and outdoor furniture for its creamy white color and enduring strength, and Western Red Cedar for the outdoor garden products such as arbors, pergolas, and trellises. When left untreated, over time cedar weathers gracefully to a silvery gray, or it can be stained to match any décor. Please see additional shipping information below. Most Rustic Natural Cedar items require some assembly. Most orders ship direct within 3-5 business days.